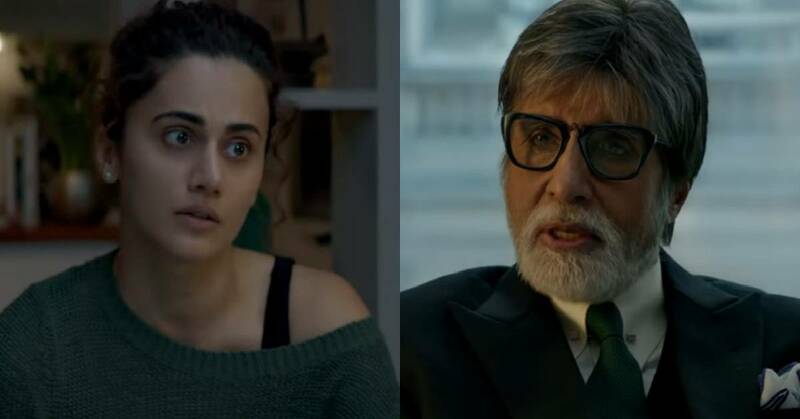 Badla Trailer: This Amitabh Bachchan And Taapsee Pannu Starrer Will Keep You On Edge With The Gripping Rush And The Thrilling Tale Of Revenge! Well, sometimes the coming together again of two talented performers results into something amazing yet again. The same can be said of Amitabh Bachchan and Taapsee Pannu who have reunited for the film Badla after sharing the screen space in the 2016 film Pink. The trailer of the film is out and we must say each moment in the gripping trailer has kept us on edge. The first look of the film was released yesterday by Shah Rukh Khan who is the producer of the film along with lead stars Big B and Taapsee Pannu. Amitabh Bachchan and Taapsee Pannu both looked intense and intriguing in the first look of the film. The film ran by the tagline 'Maaf Kar Dena Har Baar Sahi Nahi Hota.' The trailer has now managed to kept us hooked and has raised the anticipation of the film. The trailer showcases Taapsee Pannu who hires a lawyer played by Amitabh Bachchan when she is wrongfully accused of murdering her lover. It is revealed that she is a woman with a loving family and was also being blackmailed about her affair with her lover by a mysterious person. It is this tale of Taapsee and Big B's character teaming up with revenge on their mind to find the main mastermind behind these crime sets the main plotline of the film. Both Amitabh Bachchan and Taapsee Pannu deliver an intense and gripping act in the trailer and we also see a glimpse of the Tumhari Sulu actor Manav Kaul in the trailer. This one is helmed by Sujoy Ghosh who has given us a master thriller like Kahaani previously and hence the film surely promises to be a promising one. The film is produced by Shah Rukh Khan’s production house Red Chillies’ Entertainment along with Azure Entertainment. The film is said to be based on the Spanish thriller Contratiempo. It is all set to be released on March 8, 2019.